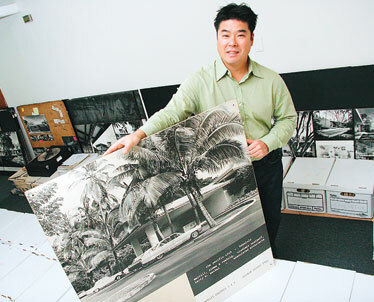 Curator Dean Sakamoto, holding up a Robert Wenkam photo of an Ossipoff design, will be on hand to sign copies of his book about the highly regarded architect. Architect Dean Sakamoto will sign copies of "Hawaiian Modern: The Architecture of Vladimir Ossipoff" from 1 to 3 p.m. Saturday. Sakamoto is the editor of "Hawaiian Modern," the catalog for the ongoing exhibition at the Honolulu Academy of Arts of the same name. The book has become the academy's best-selling catalog ever, shop manager Kathee Hoover says. Published by Yale University Press, it covers Ossipoff's 60-year career designing buildings and is filled with photographs of his structures in Hawaii. Sakamoto will appear in the Academy Shop, where the book sells for $65. Call 532-8703. The exhibit of "Hawaiian Modern" is on view through Jan. 27.